tapping the potential of wind power is no longer difficult or expensive. Technology to harness this natural force is not only improving, but more nations are finding this alternative source of p ower more desirable because it is locally available, cheap to produce and does not dirty the environment. It is no wonder that wind power has already become the world's fastest growing renewable energy source ( see box: Why wind energy) . Global wind generating capacity has expanded at an annual rate of 25.7 per cent during the 1990s, and now stands at more than 10,000 megawatt (mw). Denmark, Spain, Germany and usa have emerged as leaders in wind energy development. For Europe alone, the European Wind Energy Association has set a target of 40,000 mw by 2010 and 1,00,000 mw by 2020. With technological advances, the cost of generating wind power has continued to decline, and wind promises to become a major power source globally in the next millennium. Within the developing world, the largest wind industry is in India. The Washington-based Worldwatch Institute ( wi) recognises India as a "Wind Superpower". 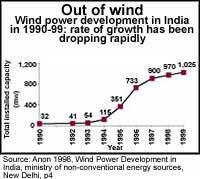 In India, wind energy development boomed during the period 1993-97 and the country rose to become one of the world's fastest growing markets for wind energy; both in terms of potential and rate of installation. In terms of capacity installed, India is placed just behind Germany, Denmark and the United States ( see table: Where India stands ) . Between 1993 and 1997, growth in wind energy sector represented approximately 6 per cent of new generating capacity installed in the country. And the government set an ambitious target of installing 3,000 mw generating capacity by 2003. But, today, the country is still far from achieving this. Out of the 20,000 mw wind energy potential in the country, only 1,025 mw had been tapped by March 1999. When the government opened the field of wind energy development to the private sector in 1993, companies queued up in front of the ministry of non-conventional energy sources ( mnes ) office. The incentives proved too hard to resist. Small and large companies alike were keen to grab a piece of the cake. Under the garb of setting up wind farms, many companies acquired sunny seaside properties and availed of all the sops (see box: Free for all ). The sites were chosen, windmills set up but power did not flow. Where they succeeded, investors did not find the returns from sale lucrative enough. There is no incentive to sell power. Private producers could only sell power to the grid, which, according to them, is not commercially viable. It is not surprising that the power sector has stopped being so lucrative an industry for private investors and investment in the wind sector has plummeted in the years after 1997 (see graph: Out of wind ). The crores of rupees invested in the wind energy sector has largely gone to waste. Today, many wind farms are lying idle. And few that are working are falling far short of their generating capacities. In their haste, both the promoters and their consultants seem to have forgotten a lot of things. They did not pay sufficient attention to selection of locations with the result that machines were erected at sub-optimal locations. "Their inexperience shows in the drafting of the purchase orders, wherein many relevant technical specifications were not mentioned," says K Phanindra Reddy and O Subamaniam in an article "Wind Power to Stay" in ireda News . "Hence the gap between estimation and the actual generation was only a logical consequence. Kirit S Parikh, director, Indira Gandhi Institute of Development Research ( igidr ), Mumbai blames government policies that provide subsidies to set up plants, but do not encourage sale of power to the grid. "We started from the wrong end. The government should give subsidy to power producers on actual power generation and not capital subsidy," he says. Till 1997, some Rs 30 billion had been invested in the wind energy sector. Some blame the halt in the expansion of the wind energy sector on the suspension of generous tax benefits. But C S Kamalanathan, former secretary of mnes , says, "The new policy was formulated to discourage small operators as they seemed more interested in availing tax benefits than producing wind power." Of the 1025 mw wind power generated in the country, commercial projects (private investor/developer) account for more than 90 per cent of the supply. But 70 per cent of the investors at present account for only 30 per cent of the power produced. "These companies are only interested in short-term gains (subsidies)," says R Suresh, research associate, wind energy, Tata Energy Research Institute ( teri ), New Delhi. It is the remaining 30 per cent of the investors who generate 70 per cent of the total wind power. In 1891, an innovative teacher called Poul la Cour of Denmark discovered that the traditional clapboard-sailed windmill, used to grind, corn could produce electricity, too. For many years, his discovery helped in lighting his high school and village houses. During both the world wars, dozens of crude wind turbines based on la Cour's design were used to keep power flowing to rural areas hit by fuel blockades. But when coal and oil began to flow again, interest flagged. Nobody thought much about the environment. Finally it took the West Asian oil crisis of the 1970s to show that wind turbines had a potential far beyond creating self-sufficiency in power generation. Rising prices and uncertain supplies exposed the vulnerability of fossil fuels. At the same time, even before the Chernobyl radioactive leak, nuclear energy was beginning to lose its attraction. Wind power offered an alternative which would score over all the existing sources of energy. The Danes were quick to refine the design of the windmills. Today, windmills of Don Quixotic fame have given way to tall, sleek, tapering structures topped by large fibreglass blades. Present day wind technology can be broadly divided into three types. First, wind pumps which use mechanical energy derived from wind energy and, second, wind energy generators ( weg s) which convert wind energy into electricity with the help of turbo generators; and, lastly, wind-electric battery chargers which produce electricity and store it in batteries. In India, a systematic approach to harness wind energy was made by the Council of Scientific and Industrial Research at the National Aeronautical Laboratory ( nal ), Bangalore, mainly in the area of water pumping and wind mills, during the early 1960s. The focus was on preparation of a wind velocity map of India, and to import, adapt, test and develop water-pumping windmills. The scientists also tested two imported wind-electric battery chargers. nal set up a wind power equipment test laboratory in 1962 at Muppandal in southern Tamil Nadu. However, the work slowed down after 1966, when the first nal wind power programme was abandoned amid hopes of cheap electricity generated by a number of mega-hydel projects. Interest in renewable energy sources was rekindled only during the oil crisis in the 1970s. The National Council of Science and Technology set up an expert committee on wind power in 1972. In the second phase of development, the department of science and technology ( dst ), New Delhi, took the initiative for technology development. Finally, in 1982, the department of non-conventional energy sources ( dnes ) took charge of wind energy development. The dnes was converted into a full-fledged ministry, the ministry of non-conventional energy , in 1992. During the Sixth and Seventh five-year plans, the stress was on development of wind pumps. By 1997, about 3,000 of them had been installed all over the country. In addition, about 120 wind-electric battery chargers had been imported, tested and installed. By mid-1980s, the focus shifted to weg s, set up under government demonstration projects. 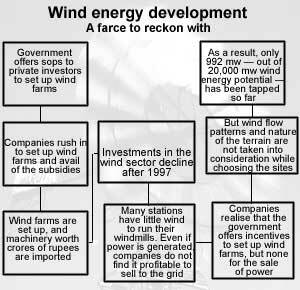 Thereafter, in 1993, the government opened the wind energy sector to private enterprise. Lured by the incentives, wind farms were set up by major industrial houses, including Madras Cement Limited and Dalmias, all over the country. With weg s requiring huge investment (Rs 4.25 crore per mw of installed capacity), small players got squeezed out. There was a virtual boom in the wind energy sector. But, after 1997, when many incentives were withdrawn, the growth rate of weg installations came down drastically. "In 1997, the government made some amendments in the incentive package. Since then, the investment rate has shown a declining trend," says Kamalanathan. However, he says, the slump is temporary. "In the long run, we will back only those producers who are committed to wind energy development." In India, the use of windmills dates back to 1879. Endowed with an extensive coastal tract and several windy regions along the coast as well as within the mainland, India's wind power generation potential is considerable. The most prominent feature of the wind climatology in India is the monsoon circulation. Winds in India are influenced by the strong southwest summer monsoon, which starts in May-June, when cool, humid air moves towards the land and the weaker northeast winter monsoon, which starts in October, when cool, dry air moves towards the oceans. During the period March to August, the winds are uniformly stronger over the whole of the Indian coast. Wind speeds from November to March are relatively weaker, though stronger during a part of this period on the Tamil Nadu coastline. Potential windy locations have been identified in the flat coastal terrain in southern Tamil Nadu, Kerala, Gujarat, Lakshadweep, Andaman and Nicobar Islands, Orissa and Maharashtra. 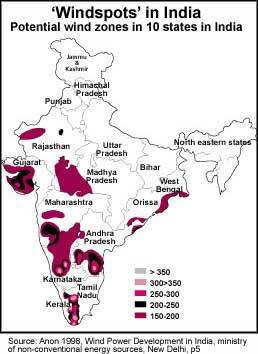 Favourable sites have also been identified in some inland locations of Karnataka, Andhra Pradesh, Madhya Pradesh, West Bengal, Uttar Pradesh and Rajasthan ( see map: Windspots) . Though there is no dearth of windy sites in India, the country has so far harnessed only a little over 5 per cent of the total wind energy potential of 1025 mw. With 725 mw of energy generation capacity, Tamil Nadu has the lion's share in the wind energy sector, followed by Gujarat and Andhra Pradesh, but the number of installations are one-fourth of that in Tamil Nadu. The other wind power generating states are Karnataka, Kerala, Madhya Pradesh, Maharashtra and Orissa but their installed capacity is far short of their gross potential (see table: Latent energy ). The wind energy sector in India has problems aplenty. There are complaints of wind energy development not yielding proper returns to investors, grid failure and transmission losses, inappropriate sites and machinery and, last but not the least, corruption. At the same time, Western nations, particularly Germany, Spain and Denmark, have a phenomenal success rate in wind energy generation. They score over India both at the policy formation and management levels (see box: Breaking records ). The reason why India, today, finds it tough to maintain the same pace which it had achieved during 1994-97, is simple. Its overall wind energy programme lacks improved technology and supportive government policies ( see diagram: A farce to reckon with) . The government policies are responsible for the failure of wind farms. "I am not quite clear why the government gives capital subsidy to investors, thereby burdening tax payers," says Kirit Parikh. "For a country of India's dimensions, the first priority should be to come up with a comprehensive national power plan. Sadly, we don't have any such thing, even at the state level. A state-level power plan can take care of more than half our problems," says Suresh of teri. Says a senior scientist on conditions of anonymity, "The period (1993-97) was big time business for many people." The scientist points out that during 1996, when the hawala racket was making headlines, there were rumours of large-scale corruption in the import of wind machines. There were pointed references to one former minister as well. There were allegations of corruption at the state-level as well. According to senior professionals in the field, in Tamil Nadu, an alleged bribe of Rs 1 lakh had to be paid to top government functionaries for every wind machine installed. Interestingly, wind energy producers are reluctant to talk about the issue, and they vaguely refer to corruption at the "lower end". In India, the economic size of wind turbines is in the range of 200-500 kilowatt (kw) for grid connected applications. The average capital cost of wind power projects range between Rs 4-5 crore per mw, including local civil and electrical works. If a lifetime of 20 years is assumed and operation and maintenance costs taken to be 5 per cent, the cost of generation varies from Rs 1.50 to Rs 2.00 per kilowatt hour (kwh) of energy generated. When investors sell the power generated to the grid, they are paid Rs 2.25 per kwh (as in the case of Madhya Pradesh) of energy generated, which they feel is insufficient. Says Sharma of M P Wind Farms, "The state electricity board should purchase electricity generated by wind farms at the same rate as charged by them from consumers, that is Rs 3.50 per unit." There is no option but to sell power to the grid, and this does not seem to be commercially viable to the private investors. One of the reasons for the decline in the wind installation capacity of these farms during the last two years is the uneconomic purchase price for wind energy generation, says A Jagadeesh, a wind energy consultant, in the May issue of Renewable Energy World . "Unless a remunerative price is offered, it is hard to expect private industry to participate in wind farms in a big way," he says. Even if the company is selling power to other companies, there is a problem of loss of power during transmission and distribution. If the grid is weak, in other words the number of transformers are inadequate, any additional burden will cause the grid to trip. "Transmission losses (of wind power) are estimated to be around 22-23 per cent in Andhra Pradesh, out of which one-third is due to grid failure," says J Manmohan Rao, member of the state electricity board. Then there is a problem of reactive power requirement, or electricity required by generators to charge their coils before starting power generation. weg s draw this electricity from the grid. According to the Tamil Nadu Electricity Board directive, reactive power requirement should not be more than 30 per cent of the wind energy generated. But manufacturers have little control over the actual situation. When there is a repeated start-stop operation, particularly during low wind speed periods, it goes up to 60-70 per cent. "The problem is there. It is a bone of contention between the government and power producers," says AS Siva Kumar of Madras Cements Ltd. Problems of grid failures take place when electricity is produced. But there are places where wind farms are lying idle because of poor micrositing -- pinpointing the exact location for a wind farm. In many case, wind flow patterns, nature of the terrain, local geography and landuse patterns have not been taken into consideration while choosing the site. Hence, many of the weg stations have little wind to run the mills. Prime examples are Tuticorn in Tamil Nadu, where the second wind farm was set up in 1986, and Puri in Orissa. Both the projects had to be scrapped because of lack of strong winds. "So compelling was the need to obtain the depreciation benefit that necessary attention was not given to selection of the location for optimum generation," say Reddy and Subamaniam judging the successes and failures of the wind projects at Ramagiri in Andhra Pradesh. As elsewhere, the wind power sector is also beset with administrative bottlenecks. Nodal agencies in several states show no sustained interest in developing weg projects. In Karnataka, despite the initial interest shown by certain private developers, there has been no follow-up. In some states, there is a problem of land acquisition for wind farms too. According to Siddalingappa, "Studies reveal that at higher altitudes, wind is available at greater speeds and the percentage of availability is also higher. But elevated hillocks are generally in the possession of the forest department. The non-availability and enormous delays encountered in diversion of such land for this purpose, is a major constraint for the speedy development of wind farms." "Further, conversion of land for non-agriculture purposes and getting clearance from various government departments such as the pollution control board, national airport authority and railway clearances add up to the problems," he says. Where wind technology is concerned, "we have technology of international standards", says Suresh. Early development of windmills in India has been greatly aided and influenced by Danish aid, according to scientists at the Bharat Heavy Electricals Limited. Danish material was more economical as well. weg s available in India now are based on successful Western models. Most of the weg manufacturers are in the private sector. According to mnes, the manufacturers have attained 80 per cent indigenisation, but all of them work in collaboration with Danish, German and Dutch firms -- the world leaders in wind technology. The nations that could benefit most from wind are in the developing world, where power demand is growing rapidly, and most countries lack adequate local supplies of fossil fuels. But if the scenario does not change, the contribution of wind energy to India's electricity demand will continue to be less than 1 per cent, which it currently is. Written by Mridula Chhetri with inputs from Manish Tiwari.